Mass Communications student Wey Lin on the set of Florida Focus. TAMPA, Fla. -- Looking right at home sitting on a news set before a pair of television cameras and having been to the Cannes Film Festival and back, one would guess senior Wey Lin is an old media pro. Only a little over one year ago Lin came back home to Florida to find her true calling in life at USF -- along with abundant opportunities to follow a new set of dreams. 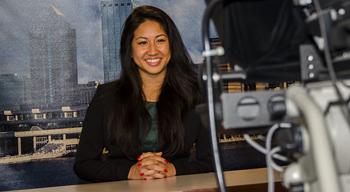 The transfer student from Rutgers University has found herself leading and growing a campus organization, anchoring a campus newscast and working with two impressive film festivals. And it all came about because the former animal science major chose mass communications for her new direction. Lin dared to risk going with what made her happy but she also went the extra mile to volunteer for something she thought she might find interesting -- three times. “I always had a passion for entertainment media since I was in middle school, and I enjoyed being in front of the camera; It took me many years to realize that I should pursue a career in that field, but I have no regrets,” she said. Lin wanted to join a club that focused on telecommunications and found the Radio Television Digital News Association (RTDNA) thanks to former faculty adviser Denise Williams who directed her to School of Mass Communications Instructor Wayne Garcia who was the club adviser for the Society of Professional Journalists (SPJ). “SPJ just took it over because no one was running it,” Lin explained. At Williams’ suggestion, Lin approached Instructor Travis Bell to see if he was interested in being the club adviser for the USF chapter of RTDNA, which is the largest organization in the world devoted exclusively to the electronic news profession. He agreed, but there was one hitch. As Lin found a leadership role right off the bat, she rose to the occasion, recruiting new members and grew RTDNA from an initial membership of 15 to roughly 35 today. Visiting individual classes to tell students about the club made all the difference. RTDNA recently hosted Joe Gumm, morning anchor for WTSP Channel 10 and Gasparilla Film Festival (GIFF) Program Director Joseph Restaino as guest speakers. Terry Dowling, a representative from USF Career Services discussed networking skills and résumé building. The club has also toured the ABC Action News station. “With the guest speakers, we get a firsthand look into potential future careers,” Lin said. “They give advice on steps we should take now in order to succeed in the broadcasting and production industry. Lin had an almost equally meteoric rise when she stepped up another time. Having already volunteered at GIFF that spring, Lin was happy to hear that Restaino would be a guest speaker in a film class given by Professor Phillip Sipiora she was taking that summer. “I saw that as an opportunity to create a relationship between GIFF and RTDNA,” she said. After approaching Restaino, she was asked to be a USF correspondent, which involved promoting GIFF events on campus. “After a while, they just decided to make me an intern so I could help out more with the festival. In a month’s time I was promoted to programming assistant,” Lin said. Now she is an important member of the GIFF team. After getting her feet wet at GIFF, Lin ventured out even further, this time to the Cannes Film Festival in France. All it took was responding to an email from a production class instructor, Kristin Arnold Ruyle. Although used to getting emails about internships and job opportunities, something made her go after this one, even with low expectations. “Once again, I never expected my application to go to Cannes to go anywhere really, but the next thing I knew, my application was accepted,” Lin said. Lin found herself among 150 interns with a variety of responsibilities. She was assigned to work for Double Dutch Media, a film distribution company. Her overall impression of Cannes was a good one. Lin returns next year as a coordinator working with the new interns -- ready to build on her experience. Back at USF this past fall Lin took the Florida Focus class, which put her in the news anchor seat. Though this was not a permanent position -- all the students take turns -- she got a lot out of it. “Every week, we tape four shows to air on WUSF, a news-of-the-day segment and another segment on either education, the military, environmental issues or health,” she said. “It's primarily student-run, from the writing of the stories to the studio to the control room. Lin had to admit there is a strong motivating factor behind her drive to succeed since choosing to transfer. “I had to prove to my parents that this wasn’t a casual decision on my part,” she said. And what do her parents think, back home in Leesburg, Fla. In the end, Lin credits working closely with Williams, her academic adviser. For more information about volunteering at GIFF or joining the USF chapter of RTDNA, contact Lin at weylin@mail.usf.edu.